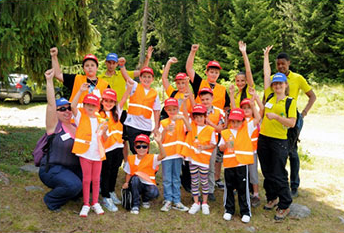 The LuckyKids International camp can be visited by children between the ages of 5 and 14,99, regardless of their level of English. All activities in the program are secured and appropriate for the children’s age. Children from 5 to 7,99 years old are admitted to the camp only with an accompanying person in order to make their adaptation easier. The children’s regimen is combined with a healthy and balanced diet. The camp program is developed specially by a team of teachers on the principle of education through projects. The children develop projects on specific topic for the specific period. Education through projects is a contemporary innovative approach that has been implemented in educational programs in all international schools in the last ten years. In addition to the language knowledge, education through projects also brings knowledge into many other areas of the social and natural world. Interactive training is also part of the camp program. All groups except for the beginners work on computers and use an interactive board. Kids from the beginners group work following different methodologies according to the dynamics within the group itself. The main thing for them is to be able to use the language so that it is beneficial to them for life in the camp. The methodologies the camp uses are various and depend on the dynamics of the current camp. The most used methods are: Play and Talk with Echo, Jolly Phonics. With all groups the focus is on children’s audio and visual perceptions which are part of many modern methods of language learning and teaching at an early stage of education such as Suggestopedia, Solar Pedagogy, Montessori, etc. All children study virtues and are encouraged to follow them in their everyday lives. An important requirement for every camp teacher is to make the educational blocks fun, interesting and to provoke the children themselves to seek new knowledge not only in English language. Stylistically the work of each teacher is unique on its own but it follows the same line set by the coordinator of the educational program. Each child receives a report at the end of the period which includes information from the teacher and aims at helping the child in its further education in English language. Life during 7 or 14 days in an English speaking environment ensures results and a solid foundation in learning a new language. Where is the camp organized? It is organized at the 5-star aparthotel Lucky Bansko SPA & Relax ***** where the children feel at home. Children are accommodated in threes in deluxe studios or in fours in big apartments with two connecting rooms where children are distributed 2 by 2. Each room has its own bathroom which is cleaned and disinfected daily. All sharp and cutting objects that could hurt the children have been removed from the rooms. Children eat five times a day at the Le Bistro restaurant. The menu is specially designed and complies with all the requirements for healthy children’s food, no harmful food. The children are provided with Kangen water during their stay at the hotel and poorly mineralized water in bottles is given during the mountain hikes. Using of the hotel’s SPA center is a real pleasure for the little ones. The bio swimming pools of which the hotel deserves to be proud are the only ones in Bansko where the water purification is chlorine-free. Swimming in them is under the supervision of licensed safeguards. Adventure showers and salt room contribute to the good mood and increase the resistance of children to illnesses. A doctor accompanies the children constantly in order to give first aid if necessary. Prices for participation in the camp are published on the hotel website. 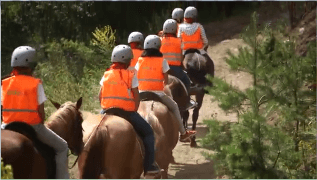 They include absolutely everything: Transfer from Sofia to Bansko and back, accommodation, food, education, additional materials, animation, activities and insurances. There is nothing that the parents would need to pay for additionally. Prices are 3 times cheaper than similar camps in England and 2 times cheaper than those in Malta which includes a lot less activities in its package. 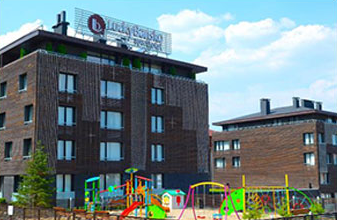 You can also find many cheaper camps in Bulgaria but those cannot guarantee the quality and efficiency that LuckyKids is offering. It is no accident that the camp enjoys huge popularity and over 35% of the children come because of a recommendation from friends or parents whose children have already been to the hotel. There are many cases where children are enrolled twice in a season /2.5 months/ and some of them stay for three weeks.